I love video games, I know the world is split in two. Those who think games are a waste of time and those who love games and who see other gamers and give each other a nod at the dirt mall looking for the rare copy of Earthbound. 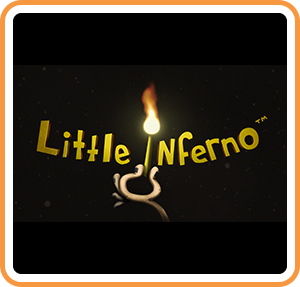 Some gamers shoot things, some play sports games, others RPG and some play useless mindless but fun games like puzzles, Animal Crossing, Pinball, and now Little Inferno. If you have not played, Little Inferno STOP_-- spoilers-- go play the game before you read this. I played this game with zero information about it. My husband bought it with zero information about it. He was told the same. Just buy and play. Once you play it then you can discuss it. Okay now, this game is a fireplace that you put things in it and burn them. You earn money for burning things and you buy more things and you don't leave your house and just order from catalogs. So this is pyromania with agoraphobia? Throw in addiction and hoarding too! You have to make combos for more points and it is so much fun. I first thought this was a joke then two hours later I was flipping back and forth trying to piece together the mystery of the combos and trying to figure out the limits of this game. I love not having any idea of what really is going on and I could be missing something but I do love to burn things in a fake world. I do worry as a parent that a game like this is going to have that effect that someone says "this made my kid burn stuff." There are warnings on the game but I know the world we live in and the game is a very obvious satire on kids entertainment. It even includes a "video" on how to use your inferno, which is little more than spooky kiddos that will give ya no idea about this game. Just stack burn and combo. Its hard to tell if this is awesome, addictive or a waste of time.